NB: Lady G’s is not running courses in 2012 but hopes to resume business as usual in 2013. Basic ingredients: Monthly residential and day courses held in a private Georgian house not far from the North Yorkshire Moors. Teaching is done in a huge modern-style kitchen around an island big enough to play table tennis that seats ten students on stools. Cooking is done on hotplates at the island and there are two ovens. 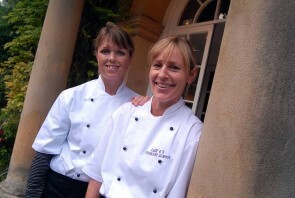 Run by two Cordon Bleu chefs – Lady Georgina Anderson and Caroline Whalley (above) – with combined experience in both the restaurant trade and private catering. The teaching is unstuffy and is aimed at beginners to improvers. The school’s motto, inscribed on the back of the two leaders’ whites, is “Cooking with Confidence”. They say: A visit to Lady G’s will be a home away from home experience as we have none of the pretensions of many cookery schools. Tasting your food is the key to having confidence, the more you can develop your palate and discover what you love to cook and eat, the more confident you will feel cooking for others. We say: Lady G’s is a welcome addition to the North’s culinary scene where choice of cookery courses seem to be dominated by Swinton Park at Masham and Bettys at Harrogate.